Harry Houdini’s escape trunk stands in the Jewish Museum like a coffin. 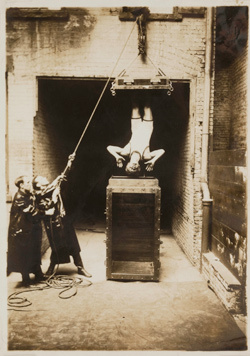 “Embedded in Houdini’s ventures were competing ambitions,” says the wall text in the museum’s new “Houdini: Art and Magic” exhibition, “he simultaneously courted mortality and the triumph of life.” There’s a lot of metaphor in a trunk: adventure, travel, excitement, secrets. Houdini turned his trunk into a symbol of resurrection. Houdini’s audiences couldn’t know what tricks went on inside that trunk after he had allowed himself to be locked in and the curtain was closed. But some part of them believed that when Harry Houdini burst free, undefeated and smiling, he had shaken hands with the Grim Reaper and spat in his eye. Harry Houdini met death and came back to tell the tale. It's all about tearing them down. And they eat it up! “Would you rather be rich or famous?” It’s one of those meaningless questions you ask when you’re trying to crack open the person you’re all smitten and warm and stupid over, when you’re trying to figure out their capacity. And maybe he has the capability to be both, but you want a value system. You want to know who he is and who he will be in 10 years because you maybe want to saddle up next to him. 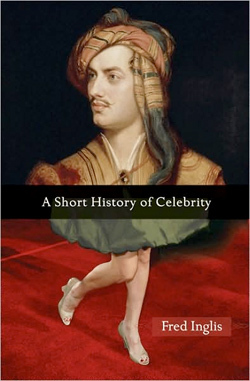 A Short History of Celebrity by Fred Inglis. 322 pages. Princeton University Press. $29.95.